Rudi Wetzl-Piewald is founder and former CEO of Compuritas, one of Europe‘s most awarded social enterprises. Choosing a master degree in German literature as ideal „preparation“ he successfully took over the role of an active social entrepreneur in 2010 and has gone through basically all ups and downs in the field eversince. 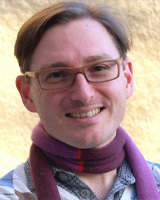 With rich experience and having constantly set the boundaries of successfully running a social startup Mr. Wetzl-Piewald handed over his company in 2018.His next challenge led him to become director of the Social Business Club Styria in order to establish Austria‘s first regional competence centre on social business. His new mission in this role is to scale up the number and quality of social ventures and to implement the basic principles of social entrepreneurship in public, science and education.Mr. Wetzl-Piewald is also active board member of the recently founded Social Entrepreneurship Network Austria.